The first thing that becomes apparent is that the A70 is a massive smartphone even for today’s standards. The display has a 6.7-inch diagonal and a 20:9 aspect ratio to help you keep a steady grip on it with one hand. Of course, as we’ve come to expect from Samsung, the display is a Super AMOLED one with a resolution of 1080x2400 this time around. Unlike the more expensive cousins of the A70 that have punch-holes for the front-facing cameras, it has an Infinity-U display, which in simpler terms means a teardrop notch. The bottom bezel is also minimal as not to add extra bulk to the already hefty device. While we’re still talking about the display, under it is the fingerprint reader, just like on the S10 and S10+. Overall, in-display fingerprint sensors are still not as good as the standard ones, but at least they’re at a very convenient location, which is important considering the size of the A70. The power button is also on the right place and not as high as those on the S series. On the back, there’s not much going on, we have only the camera bump to note. There are three sensors packed together within it, but more on those later. Samsung is calling the design “3D Glasstic” which we assume is a mixture of glass and plastic. Samsung is staying true to itself and keeps the headphone jack on the A70 as well, accompanied by the now standard USB Type-C for charging and wired data transfer. 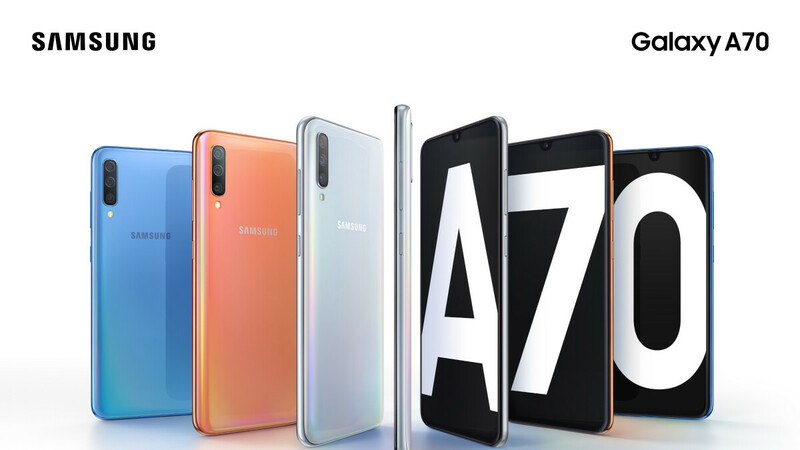 The Galaxy A70 will come in four different colors, all of them given the “prism” treatment: Coral, Blue, Black and White. Delving inside the A70, we find the Snapdragon 665, an octa-core system chip with twо higher-clocked cores and six cores for the less-demanding tasks. When it comes to RAM, there are two variants to choose from: 6GB and 8GB. The storage option is only one, however: 128GB. If that’s not enough for your needs, you’re free to expand it with a Micro SD card. If you’re worried that the huge display will lead to a short battery life, don’t be. The A70 has a massive 4,500mAh battery that should keep it running for quite a while before you need to recharge it. And when you eventually run out of juice, there’s 25W Super-Fast Charging to help you top up the battery in no time. On the software side, we have Android 9 dressed as Samsung’s One UI, just as you’d expect in a phone released in 2019. It comes with the usual digital wellness features and other Samsung goodies such as Samsung Pay and Bixby. As we mentioned earlier, the Galaxy A70 has three cameras on the back. Unlike the S line, here the telephoto camera is replaced by a depth sensor for a more advanced bokeh effect. The other two are a 32MP main camera and an 8MP Ultra Wide Angle lens. The bigger main sensor should somewhat compensate for the lack of a telelens as the pictures it takes will have plenty of detail to zoom into. The 8MP sensor of the wide-angle camera seems a bit lackluster, but we’ll refrain from judging before we see actual samples. What’s more impressive is the front-facing camera that Samsung has decided to put on the A70. It’s also a 32MP one although with a slightly different aperture (rear one is F1.7, front one is F2.0). This should result in some high-quality selfies, but again, samples will say more than numbers. 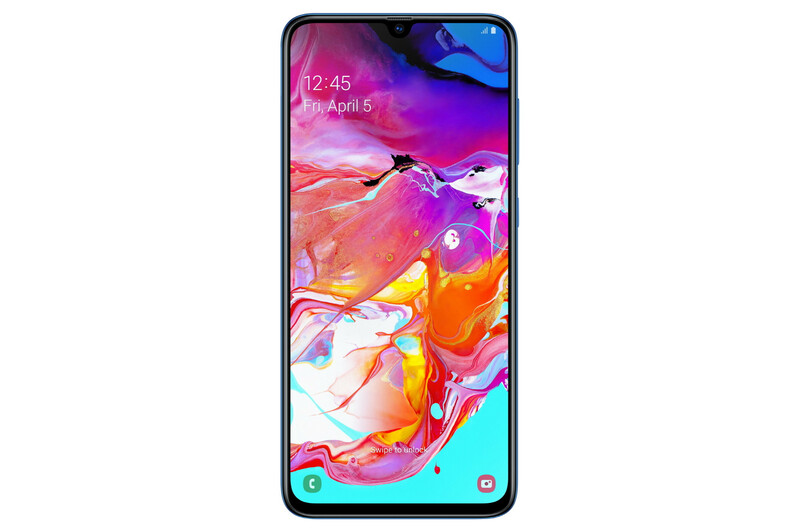 The Samsung Galaxy A70 is coming April 26. In Europe, it will sell for around 420 Euro, which converts to around $470. No information yet if this phone will make it to the US at some point, but for now it seems it's only destined for the European and Asian markets. Am I missing something? It doesn’t use a chip? Is just runs with nothing? I don’t see it mentioned in the article. "Delving inside the A70, we find currently unspecified octa-core system chip"
Apparently reading is not your strong suit. Will this come to the North American market? I wonder if u.s. prepaid will still get a 16:9 screen 3000 mah battery this year? The black color looks nice. Okay this phone has the snapdragon 730G CPU same as A80. Interesting but these phones can't compete against Apple.